Vintage Ribbon free table runner. Down load this free pattern using the new farbic line Rouenneries. For the table runner you will need 11 fat quarters plus your batting and backing. This runner is 18 1/2″ x 42″. 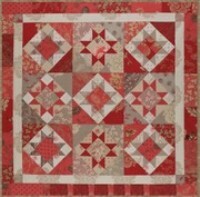 Miss Rosies Quilts has also made a great pattern using the fabric Rouenneries. We also have made a kit for this project. This makes a 31″ x 31″ table topper. This entry was posted on Wednesday, October 28th, 2009 at 1:52 pm and is filed under Uncategorized. You can follow any responses to this entry through the RSS 2.0 feed. You can leave a response, or trackback from your own site.